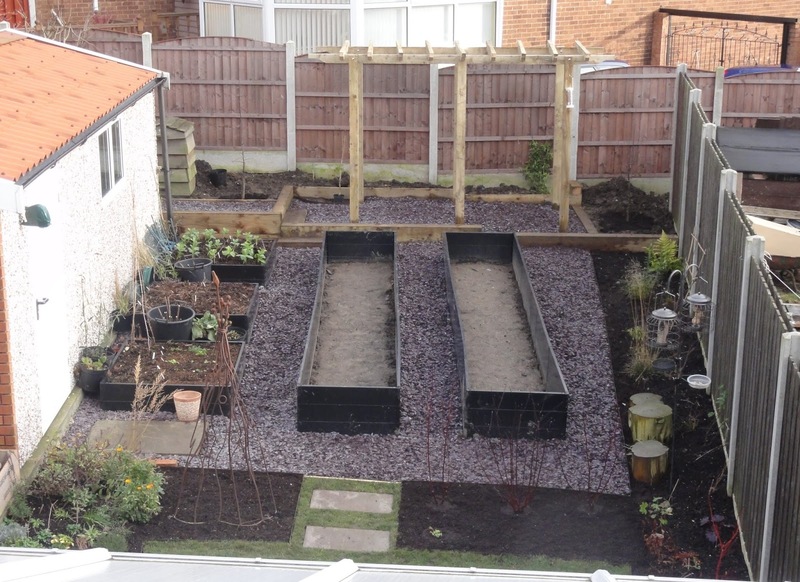 Now that the landscaping of my back garden is complete and a new year has dawned, I have decided to join Helen, @patientgardener in writing a End of Month View (EMOV) post each month. The aim is to see how this newly designed space develops over the year, and to use these posts to help me reflect on what is working and what needs improving. 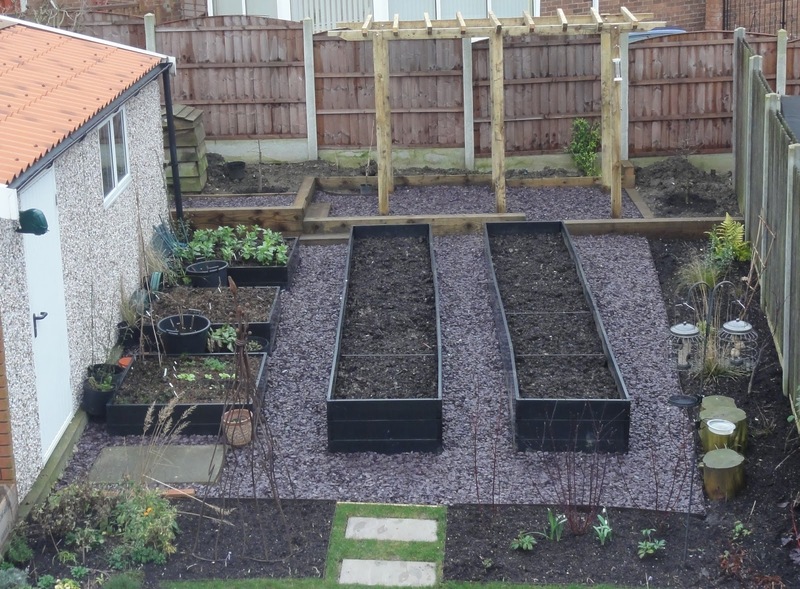 The most obvious change is that the long raised vegetable beds now have soil in them! Sheffield hasn't had quite as much rain as other parts of the country, so earlier in the month I was able to get a few more plants into the ground, including some snowdrops I picked up at Anglesey Abbey, and a couple of single spotted hellebores I picked up at a garden centre. I planted the snowdrops, Galanthus Nivalis, on each side of the Cornus alba 'Kesselringii', as I thought the contrast of dark red stems against the green and white of the snowdrops would enhance each other. I like the contrast and hope over time, as the snowdrops spread and the Cornus gains more stems from late winter pruning, this will add some mid-winter colour and interest to the garden. 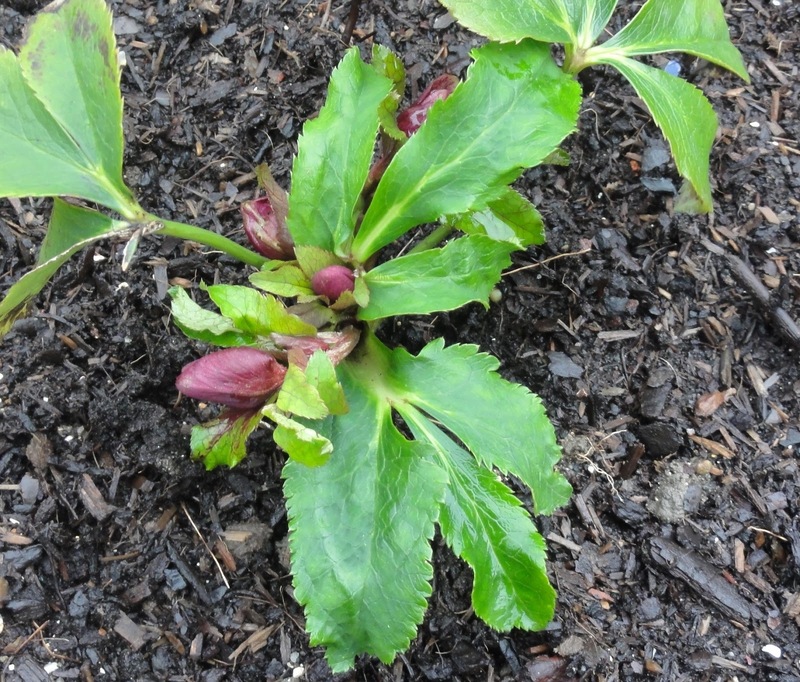 Young hellebore - with buds! I've also been reflecting on the need for more foliage, having been inspired by Helen's 'foliage update' posts. This is the border I see directly from the kitchen window, and to the kitchen garden behind it, which won't be as interesting in winter. In spring, summer and autumn months the kitchen garden and the much of the rest of the garden will have plenty to give interest. 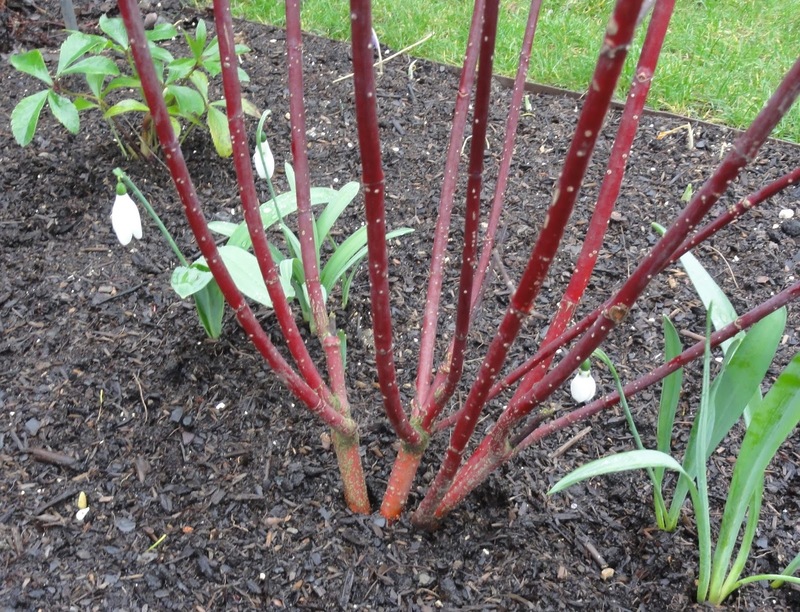 So maybe I could make the Cornus border a bit more of a 'winter border' with stems, foliage and small bulbs and corms, then with added with and summer bulbs and annuals for interest for other parts of the year? Mmmm, that's an idea. The north-facing Long Shady Border (left) got extended during the landscaping work, which means I have more space to plant into! This mainly has perennials planted in it at the moment, with the Morello Cherry, the Sarcococca confusa - now flowering, and a mix of bulbs and corms suited for a woodland. It needs more structural plants to help give it some definition all year around, so I'm thinking about adding more evergreen foliage shrubs and climbers. 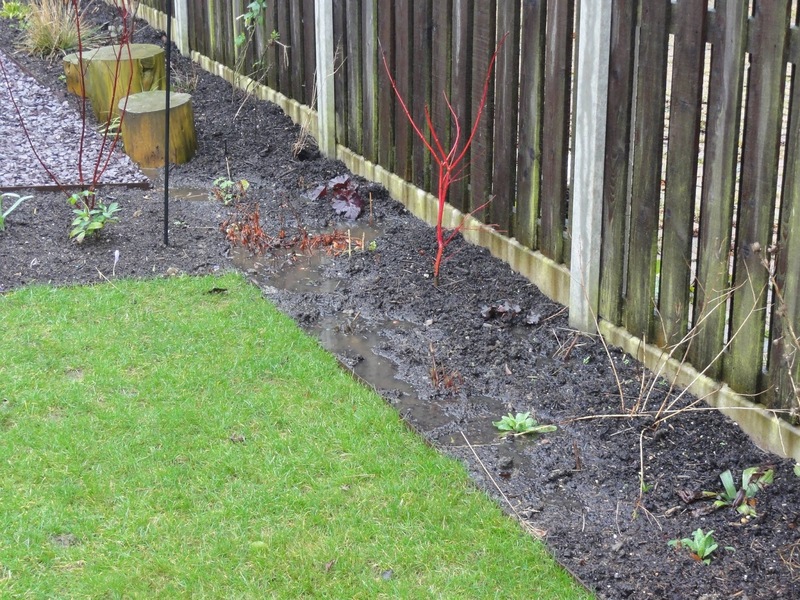 The Strawberry Border (right), also got extended slightly with the landscaping work. I've added more bulbs, including Saffron Crocus, Crocus Sativus. 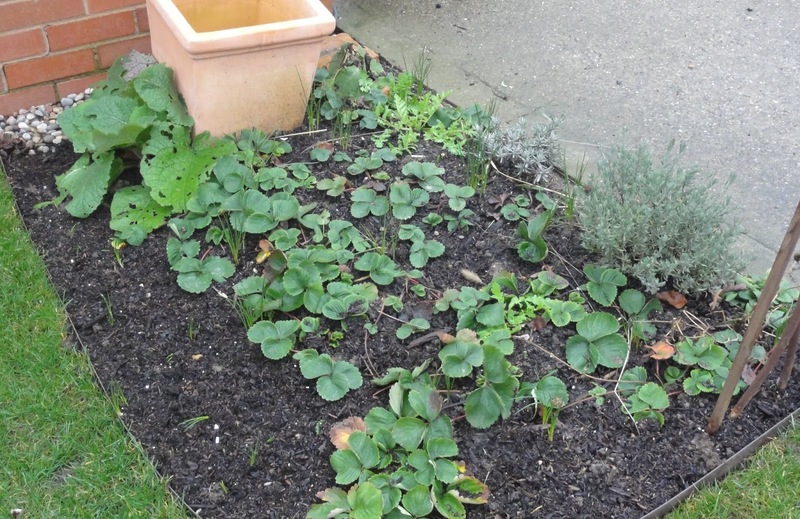 Once this years strawberry plants have fruited and started sending out runners, I'll add more strawberries here. The empty pot is where the lemon tree goes in warmer months; it's currently in the conservatory. The Herb border, again extended during the landscaping work, this time intentionally! 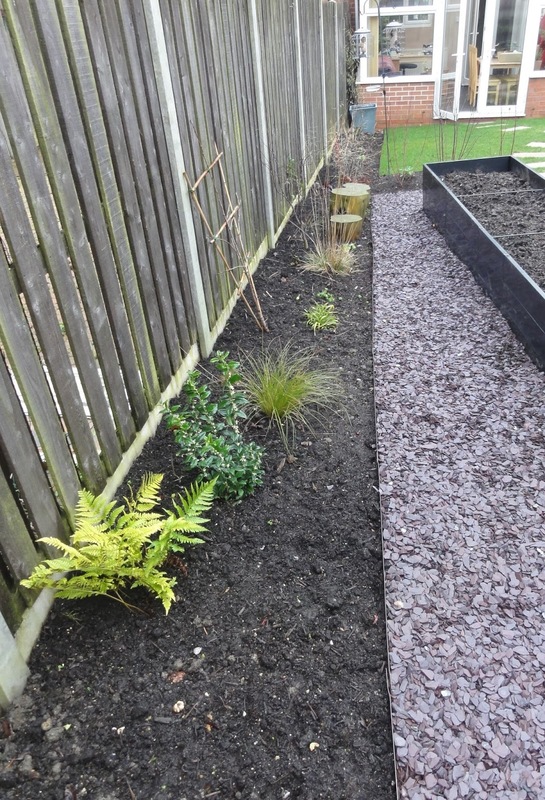 This side of the garden is south-facing so I wanted to make the most of it so extended the border so I can grow more hardy perennials and vegetables here. This year I plan on growing my favourite eating pea, Lativan, up the obelisk. It's one I got from the Heritage Seed Library years ago and I have continued to save seed. This will be the first time growing it in Sheffield, so I await to see how it grows compared to my Oxford garden and allotment. 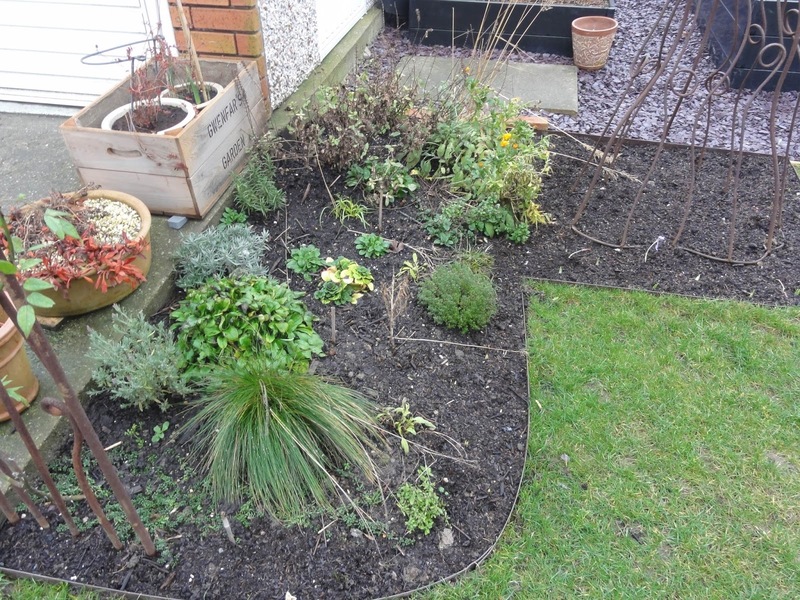 The main part of the Herb border needs a bit of a tidy, so I'll aim to do that in February, if it stops raining... Herbs I am growing include: rosemary, sage, lavender, oregano and thyme. I've also planted bulbs including Allium cernuum and Allium atropurpureum for their flowers. I noticed that my French Tarragon has died. This has rather surprised me as temperature wise it's been so mild, and it survived the last two winters in Oxford, when we had freezing temperatures and lots of snow. It's one of my favourite herbs so I'll need to replace this in Spring. Some plants aren't herbs, such as Calamagrostis x acutiflora 'Karl Foerster', Festuca amethystina, Dianthus cruentus and Anchusa leptophylla. I added these to extend the period of interest. In the vegetable borders next to the garage wall, the broad beans are doing very well and some of the garlic has start to poke its stems through. Usually at this height, I would have cut off the tops of the broad beans to encourage more stems and thereby lots more beans. However, that's usually done in Spring, not winter, and if we get are freezing spell now I'm not sure how it will effect them. I think I might cut tops off some of the plants and see what happens. I can always sow more if we do get a big freeze and that kills them. I awoke on 12th January to find we finally had our first frost of the winter. Although winter 2013/4 has not been mild from the weather point of view, with the high winds, heavy rains and flooding causing devastation over much of the country, it has been from a temperature point of view. Nearly mid-January is pretty late for a first frost of the winter! Since then though, it has been pretty wet here too. So between the rain and the fact that I've had some commitments in London, I've not been able to do any more work in the garden. The rain has shown up one problem. One area of the Shady border has become quite water-logged. Interestingly this is one of the few areas not rotovated during the landscaping work as the bed was already there, and it clearly shows! The garden does slope down towards the house, which is maybe how the rain ended up pooling in this section of the garden. Kevin suggested we put in a channel further back, under the shale in the kitchen garden, to try and soak up excess water. So another job for February. I'm just hoping the bulbs and corms I planted there survive the soaking. Sadly, I suspect not. So that's the back garden at the end of January 2014. Even though it's a small garden, only 12.84m long to c. 5-6m wide, there seems to be a lot going on it in. I'm excited to see how it will continue to grow over the coming year. End of month view is hosted by Helen Johnstone, aka @patientgardener. Visit Helen's blog for her January 2014 EMOV and links to other bloggers EMOV posts. I have that snowdrop/Cornus combo it works well. One thing I've learned from my garden is to make sure there's plenty of winter interest close to the house. I used to plant up loads of winter pots all around the garden, but then realised I didn't look at most of them that often, but I was constantly looking at the ones close by. Thanks all for your comments. I think this will be a useful meme to help me reflect and develop the garden. VP: That's interesting, I deliberately put the Sarcococca confusa thinking that would help encourage me to visit that part of the garden more in winter. However with the current weather, I've not gone there so haven't enjoyed the fragrance yet! Might have to move it. I have another one next to my front door, so at least that one will get noticed. I agree with VP, planting for winter interest near the house - and using scented plants too -makes loads of sense, in summer your eye will be drawn over it to the colour and life beyond, but on dull wet days you will have plenty of interest nearby. Your whole garden looks so immaculate and ready for new adventures, I wil enjoy watching it all develop. 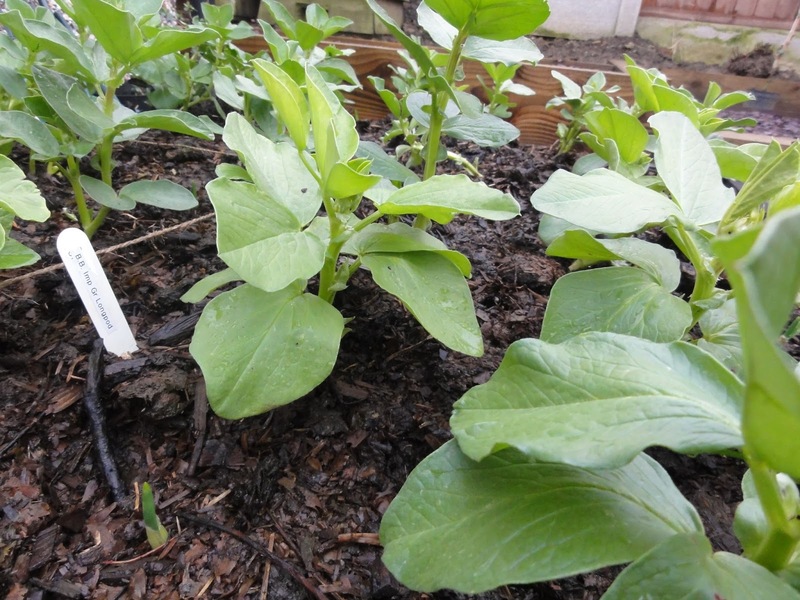 Amazingly healthy broad beans, I never autumn sow mine for fear the slugs will devour them. I'm joining in this meme for the first time too - it's a great idea isn't it. Your Cornus and snowdrop combo is just lovely. I think anything white to contrast with those red stems is a wonderful idea. I wouldn't worry too much about your hellebores - they'll soon bulk up. I don't know what spring bulbs you've planted but I find Daffs and Snowdrops cope with a bit of waterlogging. Fritilaria also cope well in damp soil. Janet/Plantaliscious: I'm definitely coming around to that way of thinking and I think the Cornus border, which I go past regularly on the way to the compost heap, will be a good place to focus winter scented planting. I might move the Sarcococca confusa there as that way I'll get to enjoy it more than where I currently have it. Angie: yes it is a great idea - it helps you focus, and I find I'm getting useful comments and suggestions that will definitely be take up. That's a good point about the spring bulbs, some of them are fritilaria and I should have remembered they should be ok with a bit of flooding. I used to visit the Iffley Meadows fritillaries each Spring in Oxford when I lived there and they always got a good drowing each winter. Thanks for reminding me, I feel less worried now. Your vegetable boxes are beautiful. And having a winter garden makes a lot of sense, I think. Something to see and love when everything else is dormant. Your cornus is beautiful!!! I have never seen this plant in person, but in your photos, it is very eye-catching - and I love it with the snowdrops!